The Honor 6X is a great all-rounder that offers the much-in-trend dual camera setup for a very reasonable price. The handset includes a 5.5-inch Full HD display wrapped in an attractive metal uni-body design. The new Honor 6X is powered by 2.1GHz Kirin 655 octa-core processor paired with 3GB RAM and 32GB storage and is running the latest Android Marshmallow based EMUI software. On the rear, you will find a 12MP shooter paired with a 2MP depth sensor that is used to sense the depth of image objects and for blurring anything in background or foreground. The overall camera performance is pretty decent. The camera app includes a pro mode, night mode, HDR mode and Pro video mode among other engaging features. The 6X will keep most of the same compromises that the 5X made to keep the cost down. The display is still of the 5.5-inch, 1080p flavor, there's still a microUSB port and no Quick Charge capability, and there's still no NFC. The lack of a proper Quick Charge implementation (more than 10W) might be a deal-breaker for some, though, the larger battery size somewhat justifies it. 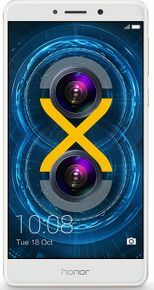 The design of the Honor 6X hasn't changed much from the previous model. The brushed finish is gone, the fingerprint sensor is circular instead of square, and there are two camera sensors on the back. The volume rocker and power button can both be found on the right, a 3.5mm audio jack is on the top, and the bottom holds a micro USB charging port sandwiched between a microphone and speaker grille. The Honor 6X isn’t packed full of the latest smartphone features, but it has a few key highlights that mean it stands out against a lot of the competition. One of these is the fingerprint scanner on the back of the phone. Phones at this price point still don’t all have the added security of a fingerprint scanner, but this one does and it's one of the speediest around. I am using this mobile since August 2017 And my experience is good with this phone. I like its multiple user feature and guest mode.